Assured Automation announces a new Propane Gas Selection Chart. The new Propane Gas chart features product descriptions, specifications, and links for integrated pneumatic valves, high pressure coaxial valves, angle valves, 2-way solenoid valves, manual and automated ball valves and 3-way ball valves, plug valves, and butterfly valves for propane gas applications. 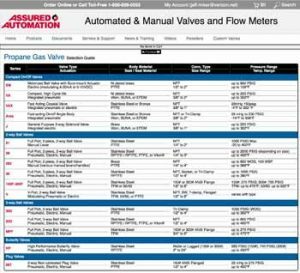 The new propane gas selection chart also features links to each valves’ configurator page, where engineers, plant managers, and web viewers can configure, customize, and order their valves online. (1 min 19 sec) on our online valve configurators. 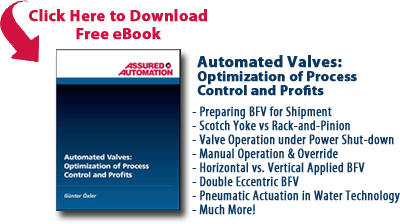 As you configure your valve, the Assured Automation online valve configurator automatically updates your valve’s model number, price, CAD drawing, and photo. To find the new Propane Gas Valve Selection Chart, go to our Products Page and look under Valves by Application. This entry was posted in Latest News and tagged ball valve, Butterfly Valve, Control Valves, nitrogen valves, oxygen valves, plug valve, propane gas, propane gas applications, propane gas valve, propane gas valves, sanitary valves, Steam Valves, valve configuration, valve description, valve spec. Bookmark the permalink.